Today’s project was a long lost pattern I had made a few months ago, but forgot to post! Better late than never…right?? It was inspired by one of my boss’s cowls that she had worn to work this past winter. It was such a cute shape and a simple enough design that I knew I had to make one for myself! On my way home from work that afternoon I booked it straight to JoAnn’s and bought two wooden buttons and a couple skeins of yarn for good measure (impulse yarn purchase only… I already had what I needed for this. Ha!). Over the next couple evenings I whipped up this cowl, and have to say it looks just like the original! I LOVED this project because once again, it knits up really quickly with the large knitting needles and chunky yarn. The entire piece is 26 inches long and when folded it fits snuggly to the neck, almost like a turtle neck. It would look really cute with a fitted black shirt! To make your own, see the pattern below! A printable PDF of this pattern is available for purchase here. Double YO – Double yarn over – knit up to the stitch before the yarn over, bring the yarn to the front of the work and wrap yarn around your right needle 2x, and continue pattern as written. Cast on 80. You will be working back and forth in rows. Row 12: knit to the bind off, double yo, knit to the end. Lay piece flat, and on the opposite end of the button holes, line up your buttons so the center rests approximately 2 inches in from the sides and 6 rows from both the cast on and bind off edges. This position should line up your button with the holes. Just to make sure, you may fold your piece over to see if the buttons line up with the holes and if not, make adjustments so they line up. 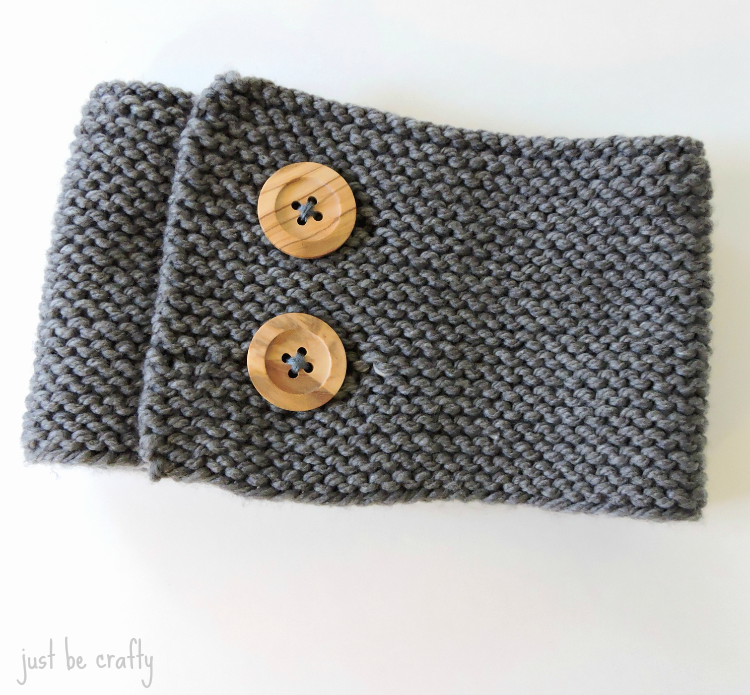 Using your embroidery floss and needle, sew the buttons to the cowl. I just was about to start this cowl and there is no way that I can get 80 stitches onto a number 10 knitting needles. Can you help me? Is there an error in this pattern? Hi Diane! Thank you for catching that!!! You will want to use US size 10 circular knitting needles in 29″. (I use this interchangeable set http://amzn.to/2dYRLRD) The pattern has been updated. Please let me know if you have any other questions! I am about to make this cowl and looking at the picture I note that the edges are all very even stitch all the way around. How do I get that look? Also, once you finish the piece, you will want to make sure you take the time to line your buttons up with your button wholes. If you rush this step, your cowl might end up a bit crooked. Once you get started, let me know how it goes! Let me know if you need anything else!! what do u mean by knit to bind off double yo knit to end? In rows 11 and 12 you are making your first button hole. To create the hole, you will bind off 2 stitches (or in other words be taking away two stitches) and in the next row you will be making a double yarn over to put those two stitches back. Thus closing the button hole. In row 11, you will be binding off 2 stitches. Then, once you get in row 12, the pattern instructs you to knit up to the bind off (or essentially to the hole you created from binding off) and then making a double yarn over. IS it possible to make this with straight needles and what size would I use ? Hi Linda, technically yes… but they would need to be longer than 26 inches. That is the length of the piece. I’m not sure if they make knitting needles that long :). Hi Mary, technically yes… but they would need to be longer than 26 inches. That is the length of the piece. I’m not sure if they make knitting needles that long :). Hi, Mary Ann. Not sure Brittany answered the question you were asking. This pattern calls for circular needles because of the number of stitches involved. You are not going to be joining the stitches to knit in the round – you’re going to knit back and forth on the circular needles. As Brittany stated, I don’t think that they make straight needles that would hold the number of stitches required for this pattern. Can you transform into a cro hey one. ? Or maybe u can figure it out myself, shouldn’t be difficult. I have been knitting some things similar to this and I cast on 14 to 16 stitches, however wide I want it and it works fine on straight needles. I’m a beginner and I tried using circle needles and had to take them back…they kept curling up ad driving me nuts. I have made 17 head bands/ear warmers and made them all this way. Hi Marjorie! That’s great you found a way that worked for you! Circular needles can be a bit tricky at first, but once you get used to them they are very handy. This pattern uses circular needles because the piece is designed to have the garter stitch lines appear horizontal. Using a set of straight needles and casting on stitches for the desired width and knitting the length of the cowl will give you a vertical garter stitch line. Both work great, it just depends on the look you are going for.